Toontrack seem to be on a mission to make everything EZier. First they made it possible to record more or less convincing drum tracks without having to understand the mechanics of drumming. Now they are attempting to make it possible to mix without understanding the mechanics of mixing. 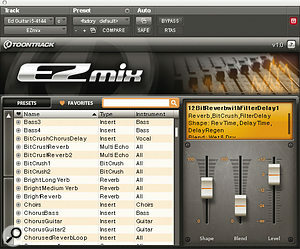 EZ Mix has been developed by Overloud, and is, at least in theory, the ultimate 'one size fits all' plug‑in. 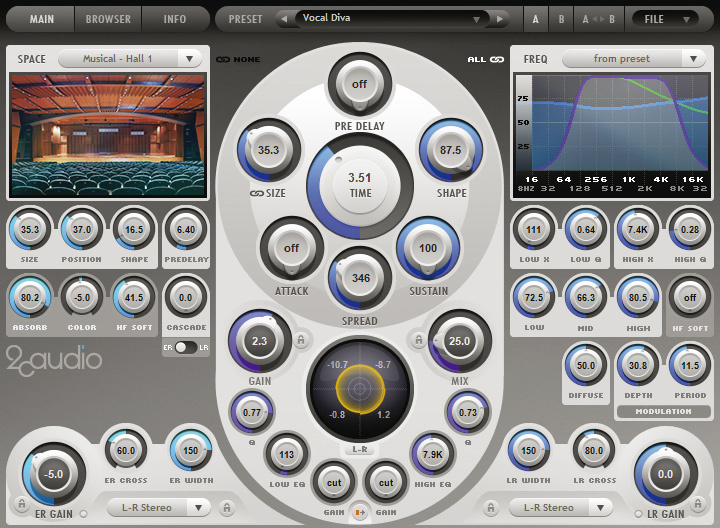 Its user interface consists of three faders labelled Shape, Blend and Level, plus a large preset browser. 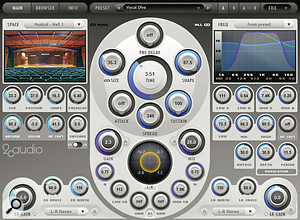 The 200‑plus presets are categorised by name, instrument type and effect type — or by the name of the programmers who created them, should you belong to a parallel universe in which that might be useful — and they can be sorted alphabetically in any of these categories, marked as favourites, and found using free‑text searches. The idea is that you insert EZ Mix across an instrument track, then browse the presets that suggest themselves as being useful for that instrument. Once a preset is loaded, the Shape and Blend sliders adjust appropriate parameters within that preset. So, for example, on the 'Chorus Guitar' preset, the Shape slider controls chorus speed, while Blend adjusts the wet/dry mix of chorus and reverb simultaneously. Others are more complex: on '12BitReverbwithFilterDelay1', for example, the Shape slider controls reverb time, delay time and feedback all together. The presets cover the full gamut of effects and processes, from simple compression and EQ to more unusual processes such as bit crushing, filtered delays and the proprietary 'Overloud' — frequently in combination. 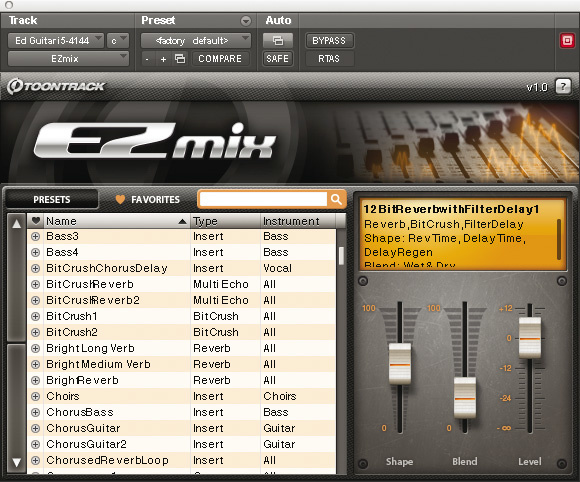 In practice, EZ Mix is sometimes more versatile than you'd expect. For instance, I was wondering how on earth any of the gated drum presets could possibly work, given that there is no user control over gate threshold, but in practice they seem to use an intelligent algorithm that can pick up wanted audio and exclude spill fairly effectively. I inserted an instance of EZ Mix over every track in a multitrack drum recording, chose appropriate presets, and was surprised at how good the results were. It sounded like a mix, and it was easy. Job done. Provided the original tracks were fairly well recorded, it likewise provided plausible bass, guitar and vocal sounds, though, naturally, they were somewhat generic. I was less taken with EZ Mix in some other roles, though. For instance, there are 20 or so reverb presets designed for use on an aux send; I didn't really warm to any of them, and two faders really don't provide enough control for a reverb. Back in SOS September 2009, I reviewed 2C Audio's first product, the rather splendid Aether reverb, whose algorithmic excellence left me deeply impressed. You might expect that this upgrade to version 1.5 would simply offer some bug fixes and the odd tweak, but in fact this is a significant upgrade incorporating many new features, including native 64‑bit versions (RTAS and Pro Tools are also promised in the near future). The original Aether interface proved to be a 'love it or hate it' design, so I'm happy to report that the new and more conservative default GUI of version 1.5 offers significant improvements to legibility, with clearer control groupings, easier to read parameter values, and photographic renditions of all the early‑reflection space options rather than the somewhat cryptic graphics of its predecessor. There's also a very handy new Frequency Profile menu that allows you to quickly change 15 EQ/damping parameters simultaneously, additional stereo modes, and a new Cascade control offering increased flexibility in the serial/parallel routing of the early and late reflection engines, while quite a few parameters offer more extreme settings (for instance, the maximum rate of the reverb tail modulation can now be increased as far as 100Hz, for some almost FM‑like sound effects). With such creative options, Aether has moved beyond the realms of 'reverb' and can now be almost considered an instrument: indeed, if you set its decay time to infinite, you can generate continuous soundscapes from almost any source. The browser window has also been overhauled, with clearer section labelling and the ability to view any or all preset folders individually or in any combination. Being able to restrict preset viewing to, for example, plates, drums and instruments is doubly useful now that two 150‑preset expansion packs are available, since these boost the total to some 600 presets! 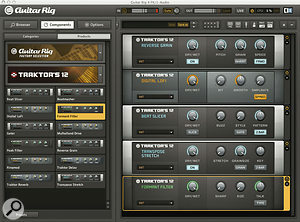 The Integrity pack concentrates on adding more halls, rooms, plates and other more traditional musical treatments to the collection, and very nice they are too, while the Creativity pack employs more extreme parameter values, offering a stunning set of mystical and thematic reverbs, plus various granular and modulation effects. However, for many users the most significant changes will be within the reverb engine itself, which offers various higher quality options. I was very impressed with the sound of version 1, but in version 1.5, critical code areas are now implemented with 64‑bit double precision, while new real‑time and offline options for oversampling, modulation, and interpolation provide yet more clarity and detail. $249.95 (free upgrade for existing users); expansion packs $24.95 each or $39.95 for both. 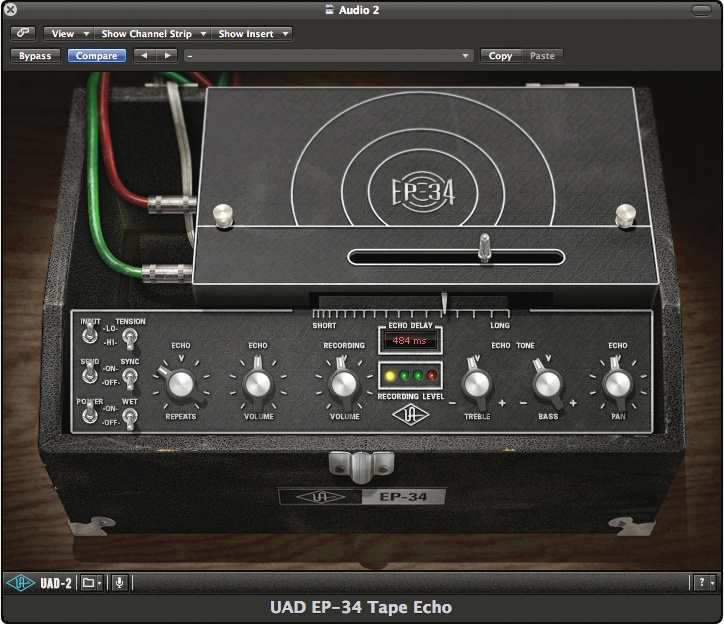 Universal Audio's EP34 Tape Echo plug‑in runs only on their newer UAD2 cards, and models the sound and features of the 'oldie but goodie' Maestro Echoplex tape delay, combining the features of both its EP3 and EP4 incarnations and offering delay times of 80ms to 700ms. Unlike the multi‑head Roland Space Echo, the much earlier Echoplex produced a single delay, with the usual feedback control adding repeats and a sliding record head to adjust the delay time. Its tape loop and circuitry introduced distortion, wow and flutter and high‑end loss that gave the impression the repeats were receding into the distance, very much like some of the delays used on Pink Floyd's Animals album. 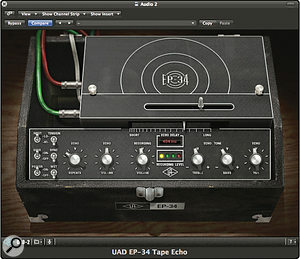 A Record Volume control allows the input stage to be overdriven, while the Repeats knob goes from single repeats through all the normal flavours of echo to dub‑style feedback. You can adjust the delay time during performance to get a pitch‑slurring effect, just as with the real thing, and there's basic treble and bass EQ for the delayed sound. So accurate is the emulation that it even reproduces the Echoplex's 'squelch' effect when using high levels of feedback with low‑pitched sounds, heard as breaks in the self‑oscillation pattern as the circuitry gasps for air! As usual, Universal Audio's designers have added a few concessions to the modern era including tempo sync, 'input level select' and tape tension, these last affecting the tonality and speed‑change characteristics of the delays. For use in an aux send loop, the Wet switch mutes the dry signal, while Echo Send On/Off mutes the signal sent to the delay section. You can automate this to add delay to specific phrases. For the benefit of any non‑boffin Sound On Sound readers (are there any? ), Traktor's 12 is a performance effects suite and one of five new products recently launched by Native Instruments to complement their Komplete range of instruments and effects. As the name suggests Traktor's 12 has, er, 12 effects, all of which have been derived from the DJ effects available in Traktor Pro, and can be used within any DAW or music sequencer. 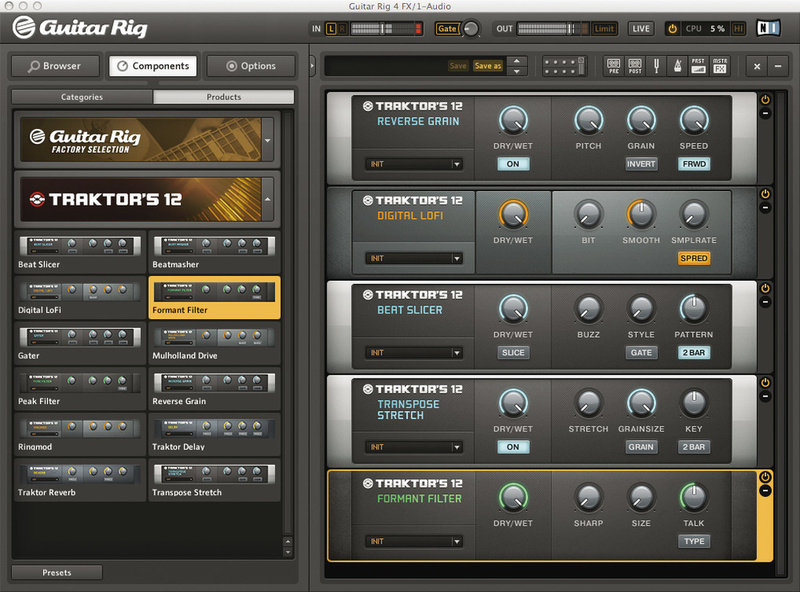 Like the other four, however, Traktor's 12 is not a plug‑in in its own right, but is designed to be used within either the free or the full version of Guitar Rig. For the purpose of this review I downloaded the free version. This was easy enough to do (although a sizeable download at 300MB), and within half an hour I was making sounds worthy of a main-room DJ, which I guess is the whole point. Once you're set up correctly, operating the individual effects is a straightforward business, as they all follow the same principle. As far as the effects go, I have to say I developed a bit of a penchant for the Peak Filter, which partied up everything so massively that my neighbour came round with some friends assuming I must be having an illegal rave. In a nutshell, Peak Filter adds a peak to the original signal in a specific part of the frequency spectrum, giving you DJ‑friendly control over the frequencies you want to hear at a level up to four times louder than the 'original' signal. This became an invaluable way of drowning out the same neighbours when they came over the following night to ask me to TURN IT DOWN. It is also cleverer than its counterpart in Ableton Live, as it keeps the overall levels constant, where standard filters' output varies. Good to know if you can't face compressing your tracks after spending the night making small box/big box moves with your hands. I also really dug the Formant Filter, which imitates the sound of vowels by morphing three band‑pass filters into each other. You can control the nature of this effect by adjusting the 'sharpness' of the vowel sound or the 'size' of the mouth. And you can use the Talk button to morph between the different vowel sounds and adjust the brightness of the sound. I became quite obsessed with trying to emulate the 'wuh uh uh woo' sound at the beginning of Bon Jovi's 'Living On A Prayer', and got pretty close — to the point that er, some Bon Jovi fans came round... er, assuming Bon Jovi were playing... OK, you get the picture. Isn't it funny how you never miss old technology until something supposedly better comes along and replaces it? When spring reverbs were the only game in town, we were constantly frustrated by their 'boingy' metallic sound, with only guitar players seeming to like them, but now that everything has gone digital, we actually miss the things! While some types of reverb can be emulated entirely by means of convolution, spring reverbs react differently depending on the nature and intensity of the input signal, so Overloud have employed a hybrid approach combining both convolution and algorithmic simulation. Their SpringAge plug‑in offers three selectable spring models based on various real‑world units. 'AQTX' has a classic spring sound, well suited to guitar and vocals, while the 'S201' model is tailored for keyboards and synths and 'Angel' presents a brighter tonality. 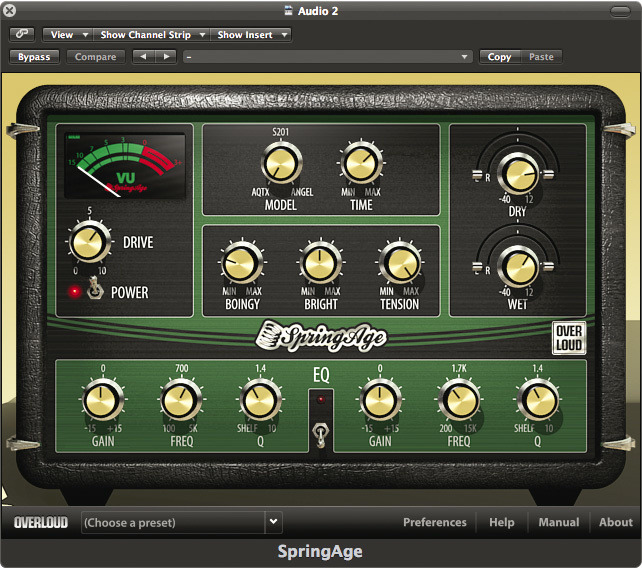 Whereas the spring units in guitar amps usually have only a level control, SpringAge is very adjustable, and includes a Drive control to add a bit of preamp warmth. You can adjust the spring tension to change dynamic response and tonality, as well as making it more or less splashy using the dedicated Boing control. There's also a two‑band parametric EQ for tweaking the tone, plus a stereo mixing function to allow independent panning of wet and dry sounds. 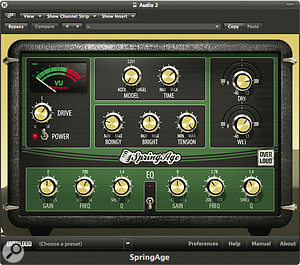 The decay time of a typical spring reverb is fixed, but SpringAge has an adjustable decay time, so it is very flexible.